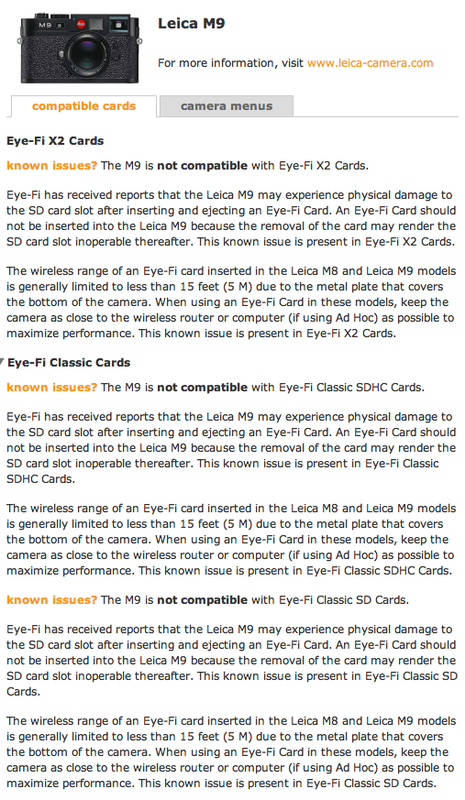 "Eye-Fi has received reports that the Leica M9 may experience physical damage to the SD card slot after inserting and ejecting an Eye-Fi Card. An Eye-Fi Card should not be inserted into the Leica M9 because the removal of the card may render the SD card slot inoperable thereafter. This known issue is present in Eye-Fi X2 Cards. The wireless range of an Eye-Fi card inserted in the Leica M8 and Leica M9 models is generally limited to less than 15 feet (5 M) due to the metal plate that covers the bottom of the camera. When using an Eye-Fi Card in these models, keep the camera as close to the wireless router or computer (if using Ad Hoc) as possible to maximize performance. 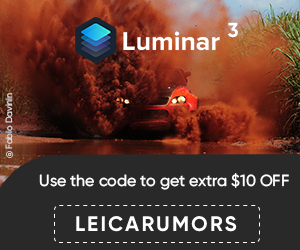 This known issue is present in Eye-Fi X2 Cards." This entry was posted in Leica Accessories, Leica M9. Bookmark the permalink. Trackbacks are closed, but you can post a comment.